Focus on your business—Not software updates. When you’re running a business, you don’t have time to be an EDI expert. Before you invest in an on-premise system, consider the benefits of cloud EDI. EDI translation software, retailer maps, VAN networks. Managing your EDI in-house requires significant technology investment in addition to IT support for implementation and updates. With cloud EDI, the burden of EDI management is handled by a team of specialists who make all the necessary updates and upgrades instantly. With a true cloud EDI system, one connection to a centralized network gives you direct access to all the retailers you do business with—now and in the future. This ensures immediate compliance with your current retailers’ requirements, without the time-consuming process of maintaining individual integrations. Organizations that use packaged software rarely consider the ongoing costs of maintaining on-premise EDI. Not only does cloud EDI save an average of 25–75% in upfront costs, long-term hidden expenses are also reduced by 50–75%. Pay only for what you use and scale up or down based on your business demands. Cloud options also eliminate the need for in-house IT support for EDI upgrades and maintenance. When managing an EDI system in-house, every software update, system glitch and new retailer integration becomes your headache. 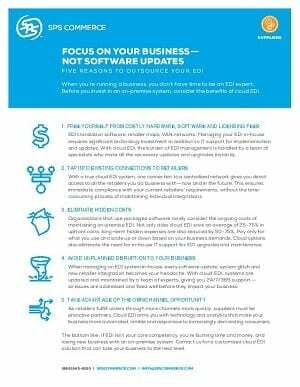 With cloud EDI, systems are updated and maintained by a team of experts, giving you 24/7/365 support— so issues are addressed and fixed well before they impact your business. As retailers fulfill orders through more channels more quickly, suppliers must be proactive partners. Cloud EDI arms you with technology and analytics that make your business more automated, nimble and responsive to increasingly demanding consumers. 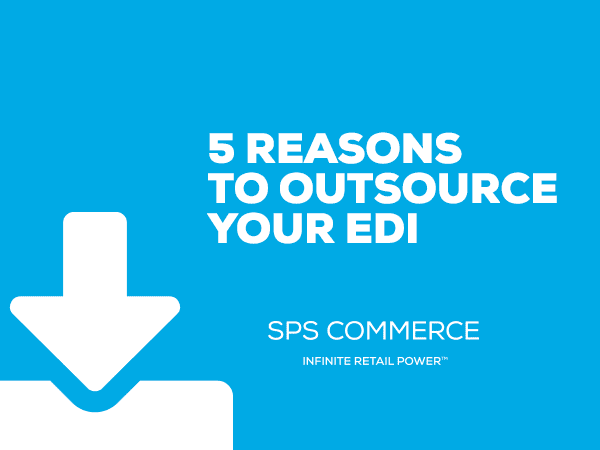 If EDI isn’t your core competency, you’re burning time and money, and losing new business with an on-premise system. Contact us for a customized cloud EDI solution that can take your business to the next level.